Developing: U.S. and Ukraine officials said the Boeing jet with 298 people aboard was shot down near the Ukraine-Russian border. The government and pro-Russia separatists denied responsibly. Warning: graphic images. Smoldering debris is seen at the crash site of Malaysia Airlines Flight MH17 near the village of Hrabove, Ukraine, on Thursday. A Malaysian passenger jet with 283 passengers and 15 crew members aboard was shot down over eastern Ukraine near the Russian border Thursday, U.S. intelligence officials said. Flight MH17 took off shortly after noon Thursday from Amsterdam to Kuala Lumpur. Malaysia Airlines said it lost contact with the plane over Ukraine's war-torn region of Donetsk. There have been no signs of any survivors. American officials believe a surface-to-air missile hit the plane as it was traveling around 33,000 feet over Ukraine, though it was unclear who fired the missile or where it came from, The Associated Press reported. Anton Gerashchenko, an adviser to Ukraine's interior minister, said on Facebook that the plane was shot down by a missile from a Buk launcher. Pro-Russian rebels had recently bragged about acquiring Buk systems. Horrific images from the scene of the crash showed large pieces of smoldering debris from the plane and bodies, some still strapped in their seat belts, littered over miles of Ukrainian farmland. "There's blood splattered everywhere, and pieces of remains," John Wendle, a freelance reporter for ABC News said. "It's a pretty grim sight ... This is terrible." Malaysia Airlines released an updated list Friday of the nationalities of those on board MH17 — they said there were 189 Dutch, 27 Australian, 44 Malaysian, 12 Indonesian, nine British, four German, four Belgian, three Filipino, one New Zealander, and one Canadian, passenger on the flight. All 15 crew members were Malaysian nationals. The nationalities of 4 others aboard the plane has yet to be verified, the airline said Friday. Ukraine President Petro Poroshenko called for an immediate investigation of the incident. He said the "armed forces of Ukraine did not take action against any airborne targets." Vice President Joe Biden, speaking from Detroit, said the jetliner was "apparently shot down." The crash was "not an accident," it was "blown out of the sky," he said. Malaysian Prime Minister Najib Razak said at a press conference Thursday evening the Boeing 777 did not send out a distress call before the crash. He said that Malaysian authorities believe that the plane was shot down, but he "is unable to verify the cause of this tragedy." In response to the crash, the Federal Aviation Administration banned U.S. flight operations in eastern Ukrainian airspace over "continued hazardous activities." Donetsk People's Republic, the pro-Russian separatist movement in southeastern Ukraine, has denied involvement in the downing of Flight MH17. "We do not have any idea what this is about and who shot down the plane," Tatyana Dvoryadkina, co-chair of the DPR told gazeta.ru. "We're heading there now to investigate everything independently." The incident marked the second time in six months that Malaysia Airlines had lost contact with a plane. Flight 370, a passenger jet carrying 239 people over the South China Sea, disappeared in March and has yet to be found. Earlier Thursday, the Ukrainian government said that a Russian military plane had shot down a Ukrainian fighter jet in Ukrainian airspace the previous evening, the New York Times reported. According to reports, the plane came down 20 miles short of entering Russian airspace. A video released Thursday purported to contain audio intercepted by Ukrainian Security Service SBU of phone conversations of separatists admitting to downing the Malaysian plane. Here is an English translation of the conversation intercepted by SBU. Kyiv Post's Chris Miller reports that the conversation is between Igor Bezler, a Russian military intelligence officer and a leading commander of the Donetsk People’s Republic. Igor Bezler: We have just shot down a plane. Group Minera. It fell down beyond Yenakievo. "Major": These are Chernukhin folks show down the plane. From the Chernukhin check point. Those cossacks who are based in Chernukhino. "Major": In short, it was 100 percent a passenger (civilian) aircraft. "Major": I haven't ascertained this. I haven't been to the main sight. I am only surveying the scene where the first bodies fell. There are the remains of internal brackets, seats, and bodies. Alexander Borodai, self-proclaimed prime minister of the Donetsk People's Republic, told BuzzFeed the rebel group was not responsible for taking down MH17. Donetsk rebel PM Borodai tells BuzzFeed they&rsquo;re innocent in MH17 crash. Appeals to Ukraine forces to &ldquo;stop shooting so we can investigate." Donetsk rebel PM Borodai tells BuzzFeed theyâ€™re innocent in MH17 crash. Appeals to Ukraine forces to â€œstop shooting so we can investigate." Donetsk rebel PM Alexander Borodai says they&rsquo;ve sent a prosecutor to investigate MH17 crash and welcome help of &ldquo;international experts." Donetsk rebel PM Alexander Borodai says theyâ€™ve sent a prosecutor to investigate MH17 crash and welcome help of â€œinternational experts." Vladislav Seleznev, spokesman for the armed forces, said on Thursday that rebels took the plane's black box. However, it is being reported on Friday that the pro-Russian separatists are now allowing access to the crash site. The wreckage of MH17 on the morning of Friday, July 18. A second black box was reportedly recovered by rescue workers on Friday. The destination of the black boxes is currently unclear. Initial news reports said rebels had taken it and were sending it to Moscow, others on Friday said the black box had been retrieved by Ukrainian authorities, or at least that a second one had. The next of kin of the 154 Dutch victims and all the other nationalities have the right to know what happened. On Friday morning, flags around the Netherlands were flying at half staff. A flag flies half-staff at Binnenhof, the seat of the Dutch government, in The Hague, Netherlands. A statement from Malaysia Airlines said the B777-200 aircraft had a "clean maintenance record" and a "clean bill of health". The aircraft's last maintenance check was on July 11, 2014. "The aircraft was manufactured in July 1997, and so had 17 years in service. The aircraft had recorded 75,322 hours with a total of 11,434 cycles. "All communication system on the aircraft were functioning normally. The B777-200 uses the Rolls-Royce Trent-800 engine and has a 282 seat capacity." Amateur video appears to show thick black smoke from the area in east Ukraine where MH17 reportedly crashed. Emergencies ministry members working at the site of the crash in Grabavo. Armed pro-Russian separatists arrived at the crash Thursday. FlightAware shows the last known radar tracking of flight MH17. 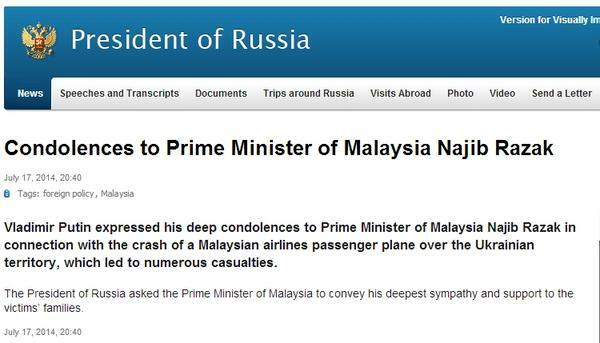 Malaysia's prime minister tweeted that the country is are launching an investigation into the crash. The U.S. State Department could not confirm that there were Americans on board the plane. These photos appear to show wreckage from the scene of the plane crash. Graphic photos from Russia's LifeNews appear to show the aftermath of the crash. Passengers wait at the departure hall at Kuala Lumpur International Airport in Sepang, Malaysia. Air travel providers have announced they are avoiding or rerouting planes away from Ukrainian airspace. Lufthansa, KLM, Aeroflot, Virgin Airlines, Delta, and Air France have all announced that they are re-routing flights and avoiding Ukrainian airspace. British Airways says its flights are not using Ukrainian airspace, with the exception of its once-a-day service between London and Kiev. Ukrainian president Petro Poroshenko says Ukrainian armed forces were not involved in the plane being brought down. Ukrainian President Petro Poroshenko believes a "terrorist act" was the cause of a Malaysian airlines passenger plane crashing on Thursday, his press secretary said. "Poroshenko thinks this of the plane that was brought down: It is not an incident, not a catastrophe, but a terrorist act," Svatoslav Tsegolko said. Speaking on Friday, Poroshenko said: "Shooting down a civilian aircraft is an act of international terrorism, targeted against the entire world. This is a wake-up call for the whole world. We expect an adequate response from the international community. We offer our heartfelt compassion to the relatives of those passengers and crew who will not see their loved ones again. For weeks we have shed tears over our own dead. We have tears left for the innocent victims of this crime. Today Ukraine mourns with you." Ukrainian Prime Minister Arseniy Yatsenyuk also reacted angrily, blasting "terrorists" for committing an "international crime". President Obama says "we are working to determine if there were American citizens on board" MH17. President Obama called President Poroshenko while on board Air Force One on Thursday. Obama assured Poroshenko that U.S. experts will offer all possible assistance immediately. Obama emphasized that all evidence from the crash site remain in place at the crash site until international investigators are able to examine all aspects of the tragedy. Obama also spoke to Prime Minister Najib and expressed his condolences to the people of Malaysia. The president told the prime minister that the United States has offered immediate support in the investigation. President Obama on the phone with President Poroshenko on Thursday. Russian president Vladimir Putin offered condolences over the crash of MH17. In a separate statement, Putin said that Ukraine "bears the full responsibility for this terrible tragedy." After 28 Australians died in the crash, the country's prime minister, Tony Abbott, described Russia's decision to blame Ukraine for the disaster as "deeply, deeply unsatisfactory". Earlier, Australian foreign minister Julie Bishop called a meeting with Russian ambassador Vladimir Morozov in Sydney, who blamed Ukranian forces for the conditions that lead to the crash. Cor Pan, a Dutch passenger on downed MH17, reportedly posted "if it disappears, this is what it looks like" on Facebook before taking off Thursday morning. Relatives of passengers on MH17 wait for information outside the family holding area at the Kuala Lumpur International Airport in Sepang. Akmar Binti Mohd Noor, 67, whose sister was on board MH17, cries outside the family holding area at the Kuala Lumpur International Airport. With additional reporting by Nadiya Pashkova.